Although controversial, receiving the flu vaccine while pregnant is shown to be safer for baby than not getting one, according to a new study. Here's why it matters. When I was in my fifteenth week of pregnancy, I got what I thought was a cold. By the time I dragged myself to urgent care and received a diagnosis of the flu, it was too late for any anti-viral medication. I was the sickest I'd ever been in my life, laid up in bed for a week. Scared for my unborn baby, I was kicking myself for neglecting to get a flu shot. Luckily, I got better and my baby was born healthy. Vaccination is probably the most hotly debated topic in the world of parenting, and that includes the flu vaccine. 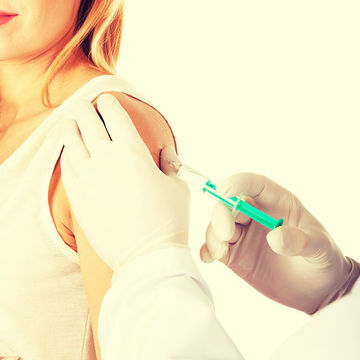 Fear over its safety, especially during pregnancy, has kept many moms from getting vaccinated. But, a new study in the journal Clinical Infectious Diseases shows that in reality, getting the shot is actually better for baby than not. Researchers looked at over 58,000 births in Australia during 2012 and 2013, including almost 53,000 mothers who hadn't received the vaccine and just over 5,000 women who had. "We found that women who got an influenza vaccine during pregnancy were 51 percent less likely to have a stillborn baby compared to women who did not [get vaccinated]," study author Annette Regan, of the Western Australia Department of Health, tells Fit Pregnancy. Although the study didn't measure how many women actually had the flu, it did note an increase in stillbirth following periods of increased flu virus circulation, establishing that a link exists. Thus, "these results show that influenza vaccine may offer some protection against deaths in babies," Regan says. This is the first study to show this reduced risk during a typical flu season, and backs up previous research that showed a lower rate of stillbirth among vaccinated mothers during an outbreak. Pregnant women are at greater risk for coming down with the flu because of a lowered immune system. Also, a pregnant woman's heart and lungs are already doing extra work handling the pregnancy, so a serious illness like the flu can put her in danger of complications like pneumonia. The flu has also been linked in previous studies with preterm labor and premature birth; and fever from the flu can lead to birth defects. "We know that influenza can be very serious during pregnancy," Regan says. "Pregnant women are more likely to be admitted to hospital, and these serious infections pose a risk to the growing fetus. During the 2009 [swine flu] pandemic we saw a big increase in stillbirths due to the serious infections in pregnant women." The best way to protect against infection, she says, is to get vaccinated. Many expectant moms are worried that the vaccine itself will be detrimental to their baby, but this study and others shows that the exact opposite is true—the vaccine actually has preventative effects. "Women are told to avoid a number of things during pregnancy, so it is perhaps understandable that some are wary," Regan says. "However, there are a large number of studies which show the vaccine is safe in pregnancy and protects the baby from influenza in the first six months. Now we can see that there are potentially other health benefits from vaccination to the baby." The study notes that less than half of pregnant women get the flu shot, but Regan hopes her research will raise that number. The vaccine is different from season to season, so it's important to get it every year. "The decision as to what strains are included is made by an expert committee that meets twice a year," Regan says. "This method of selection is meant to ensure we are continually protected against the most common strains of influenza virus—and yes, the H1N1 strain included in the current vaccine protects against the same 2009 H1N1 virus [the famous 'swine flu']." The CDC (Centers for Disease Control) recommends everyone get vaccinated soon after the shot becomes available—by October if possible, although better late than never. Regan advises receiving the vaccine a few weeks before the start of the flu season (October to May, peaking December to February, in the US). Plus, the earlier everyone gets vaccinated, the less people will become sick and spread it to others. The shot should last for one whole flu season—and it's the same shot the whole season long, so don't worry about it changing if you get vaccinated early. Although you can't totally avoid the flu, getting vaccinated and following proper hygiene methods like hand washing can help. The vaccine doesn't protect against all flus, so if someone you're in close contact with, like a coworker, has the flu, it's best to keep your distance. Ask your boss to advise your ill colleague to stay home, because you have the right to a safe working environment. But Regan says you don't need to stay home yourself if you've gotten vaccinated and there's sickness in the office. The flu vaccine isn't perfect, and additional steps are still needed to protect yourself. But as studies like this one have shown, the flu shot does help keep you and your baby safe. "It's also important to remember that pregnant women can be vaccinated in any trimester of pregnancy," Regan says. "We're hoping that this information will improve women's confidence in influenza vaccine, and seek out vaccination during each pregnancy." For myself, if I had known how scary it would be to have the flu while pregnant, I would have been sure to get that shot.